Last week, Bon Appétit magazine released its list of the 50 Best New Restaurants in America, and today it crowned the top 10. L.A.’s sole representative on the short list? Not Trois Mec. Not POT. Not Maude. The number 10 best new restaurant in America, according to Bon App’s restaurant editor Andrew Knowlton, is Grand Central Market—downtown’s 97-year-old assemblage of food stalls that has, over the past year or so, been slowly transforming into one of the city’s most vibrant culinary hubs. We’re flattered, really—but does great pastrami, Thai snacks, egg sandwiches, burgers, and coffee under one roof really warrant such praise? Last year many (including me) thought Knowlton went a little overboard when he crowned Alma, Ari Taymor’s offbeat spot on Broadway, the nation’s number-one new restaurant. It would be easy to say he’s guilty of the same thing here—shunning the expected choices (ahem, Ludo) to laud something radical for radicalism’s sake. After all, appearing “edgy” is sort of the new Bon Appétit’s M.O. So, is that what’s going on here? No. No it isn’t. This is, ladies and gents, a rare but wonderful case of an interloper nailing L.A. 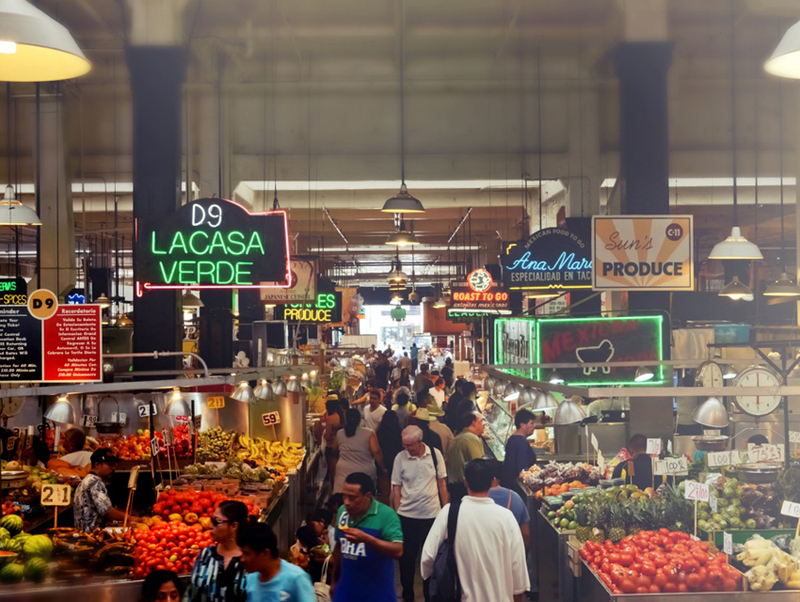 In fact, with his outsider perspective, Knowlton was probably better equipped than us natives to recognize Grand Central Market as something so much more than the sum of its delicious parts. Not that it’s our fault: With nouveau vendors opening slowly, one by one over the last year or so, GCM’s awesomeness crept up on all of us. Gentrification issues, too, have kept many Angelenos from exalting the market’s better, faster, stronger version with too much enthusiasm, lest we appear insensitive. But I think now is a good time to step back and give ourselves, as a city, a big pat on the back for creating something truly wonderful and quintessentially L.A. Because what’s more “us” than a gussied-up Jewish deli beside an old schoolpupuseria next to a Kombucha counter near a funky carnitas stall, which isn’t far from a high-end, sustainable butcher, which butts up against a crappy bodega selling lotto tickets and candy? Throw in a mix of hipster loft dwellers, elderly Latinas, and a few vagrants and, well, you’ve got Los Angeles in one spicy, gritty, open-air package. Yes, there are issues here. By passing over some of the city’s great chef-driven spots the magazine is furthering L.A.’s reputation as having great food, but lousy restaurants. And yes, apparently it takes a dozen or so mini L.A. enterprises to get on the same list as some stoner pan-Asian joint in San Antonio—which is annoying. It’s also worth noting that Grand Central Market still has a ways to go if it wants to be the “Ferry building of Southern California”—namely a primo produce vendor and some better seafood options (there is an oyster bar forthcoming!). But generally, I think we should to take a moment to give Bon Appétit a big thumbs up. It’s never easy for an outsider to tap into the pulse of a city, especially in L.A., where we tend to specialize in overhyping the wrong things. In this case, they got it right. Now, who wants a smoked salmon bagel and some beef curry?